The Brilliant Anti Armor (BAT) is a self-guided submunition that uses on-board sensors to seek, identify, and engage enemy combat vehicles. Thirteen BATs are dispensed from the Army Tactical Missile System (TACMS) Block II missile. The Army has been developing two BAT variants. The basic BAT variant is designed to engage moving armored vehicles using acoustic and infrared sensors. The acoustic sensor acquires and guides the submunition to the moving vehicles. Once in the vicinity of a threat vehicle, the infrared sensor guides the BAT to its aimpoint, where it uses a tandem-shaped warhead to destroy the vehicle. This precision engagement capability is designed to provide joint U.S. and combined forces a capability to interdict enemy formations at depth, contributing to dominant maneuver. The pre-planned product improvement (P3I) BAT variant is designed to attack moving and stationary armor as well as transporter-erector-launchers (TEL) and multiple rocket launchers (MRL). As with the Basic BAT, P3I BAT will use acoustic sensors to initially acquire moving vehicles. Once acquired by the acoustic sensor, the P3I BAT uses its millimeter wave and imaging infrared sensor to track the target to impact. When the system engages stationary targets (armored vehicles and TELs and MRLs), the P3I BAT will use its millimeter wave and imaging infrared sensors to detect, acquire, and track a target to impact. Both Army TACMS Block II and Basic BAT were approved to enter low-rate production in February 1999. The P3I BAT commenced development in July 1999. A Defense Acquisition Board (DAB) decision to change production from Basic BAT to P3I BAT will be made in December 2003. Due to poor performance, the Army cancelled IOT&E of the Basic BAT after completing two of the five planned missions. Due to this recent cancellation, OSD approval of a revised P3I BAT acquisition strategy is pending. Basic BAT technical and operational testing for the past year has focused on missile firings of the Army TACMS Block II/BAT. There were three missile flights (39 BATs) this year. The operational tests were conducted in accordance with the DOT&E approved TEMP and OT test plans, and DOT&E observed all flights. P3I BAT conducted the final captive flight tests at Grayling, MI, to collect target signatures and develop submunition algorithms. In May 2001, the contractor conducted a recoverable BAT (RBAT) engineering test. RBATs have similar hardware and algorithm to the P3I BAT. However, when an RBAT locks onto a target, it briefly tracks it and deploys an additional parachute so that it can be recovered. Hence, multiple tests can be conducted with the same hardware. The engineering test uncovered technical problems with the RBAT recovery system and the millimeter wave and infrared sensors, which the contractor is addressing. The next RBAT test is scheduled for early 2002. Basic BAT LFT&E activities continued in FY01. The most significant accomplishment was the completion in March 2001 of the seven Basic BAT rail shots against a T-72 tank. P3I BAT LFT&E activities also continued in FY01. DOT&E continues to work with the Army to develop a robust test and evaluation strategy (both OT&E and LFT&E) for Army TACMS Block II/ P3I BAT, which will be included in an updated TEMP. Performance, weather robustness, and system targeting are areas of concern. There were three missions fired as part of the operational test, with limited success. In the first mission, there were no hits. The aimpoint of the missile was adjusted to simulate the error in targeting during combat. The target array consisted of moving threat vehicles, with Defense Intelligence Agency approved countermeasures. Winds contributed to poor performance by creating significant background noise, making difficult the detection of the target array by the acoustic sensors. The next mission was a technical test, with the same countermeasures. A small operational targeting error was chosen to optimize effectiveness. Two armored personnel carriers (BMPs), one with a camouflage net countermeasure, and one with the full countermeasure) and one truck were hit. The truck hit does not count in scoring for BAT. The third mission was fired against a dispersed array of three moving columns. The two flank columns were comprised of stationary targets at high idle. The center column was moving. No targets had countermeasures. Four targets were hit (one of them twice) in a flank column. Analysis indicates that the BATs had high acoustic background noise, miscalculated altitudes, and other problems. Most of these problems were likely caused by turbulent air conditions. The project office is investigating whether corrective actions are required. BAT submunition reliability is below the ORD threshold. DOT&E scored 84 percent (31/37) of the production representative BATs reliable. The Milestone III requirement is 91 percent. A BAT is scored reliable if it functions as designed. This is a measure of hardware and software reliability, not mission effectiveness. A reliable BAT can miss a target. 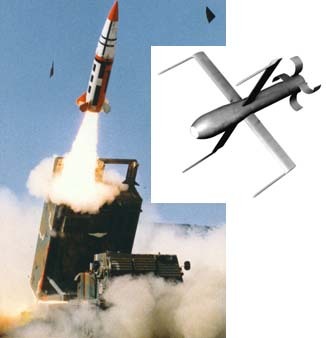 The contractor had problems delivering Army TACMS Block II missiles with all BATs functional. This year, two of the five missiles delivered to the range had one BAT test badly. When fielded, the Army plans to conduct periodic testing of the missile stockpile. If only one BAT tests bad, then the missile will be kept in the stockpile. The contractor was allowed to replace the BATs in both missiles because they were DT events. Missile firings to date indicate that the missile will meet its accuracy requirement. Also, 100 percent (37/37) of the production-representative BATs were successfully dispensed. The LFT&E strategy for the weapon system was developed to take advantage of expected hits on armored vehicles during the planned flight tests of Basic BAT submunitions with live warheads. There have been 30 BAT drops/dispenses with live warheads that have been scored to date; seven of these have detonated on targets (including tanks and light armored vehicles). These test results, along with the detailed lethality results from the seven shots against a T-72 tank in dedicated LFT, should provide sufficient data to determine whether the Basic BAT submunition can meet its lethality requirements, given a hit against moving armored vehicles. Accuracy and command and control tactics have been adequately demonstrated thus far in the program. As part of Block II/BAT's total system evaluation, a command and control operational test was completed in May 2000. This test examined the ability of the Army's command and control system to track and target large armored columns. The operational test showed that the Army could produce targeting errors that are within Block II/BAT's stated operating parameters. Due to the cancellation of operational testing, Block II/BAT's ability to overcome these operational errors will not be demonstrated. The Block II/P3I BAT IOT&E must now demonstrate this ability. The ability to find and locate Block II/BAT targets is an area of concern. The Joint Surveillance Target Attack Radar System (JSTARS) is the only targeting source for an Army TACMS Block II/BAT target set, comprised of armored columns moving deep in the battlefield. The Army conducted a technical demonstration of JSTARS' ability to acquire Army TACMS Block II/BAT targets. The demonstration showed that, if JSTARS is available, it is capable of producing accurate and timely data in flat terrain with little radar clutter and no extraneous targets. However, JSTARS was not available to provide targeting information for half of the 3 days of testing due to reliability problems. It is questionable whether JSTARS will be available consistently to provide targeting information.